"Call for Artists: Courthouse Gallery Seeks Exhibition Proposals"
The Lake George Arts Project invites emerging and professional artists to submit exhibition proposals for the Courthouse Gallery 2008 exhibition schedule. The Courthouse Gallery presents 5 to 7 exhibitions yearly of regional and national contemporary visual artists in all media. 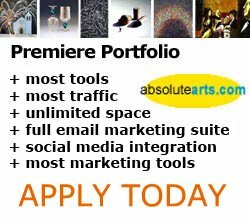 Artist�s submissions are reviewed and selected by a Gallery Committee. Strong preference is given to experimental or non-traditional work created within the last two years. Artists are asked to send ten to twelve 35-mm slides of recent work in a plastic slide sheet, or 10 to 12 jpegs on a CD. All exhibition proposals must include a hardcopy of resume, statement and slide list (listing image title, medium, date and dimensions). To view complete Submission Guidelines, as well as view samples of previous exhibits, please visit www.lakegeorgearts.org. The postmark deadline for proposals is January 31, 2007. Selection and notification will be complete in April, 2007. Materials so designated and accompanied by a self-addressed stamped envelope will be returned at that time. Send proposals to Lake George Arts Project, Courthouse Gallery, 1 Amherst Street, Lake George, NY 12845.